The CME Group raised U.S. crude oil futures margins by 25 percent as of the close of business on May 10, helping to bring prices down following a $5 a barrel spike on Monday. 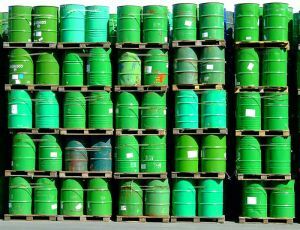 The move comes after a volatile, frenzied week of oil trading that saw U.S. crude prices [CLCV1 100.89 -1.66 (-1.62%)] fall from over $114 a barrel — the highest level since 2008 — to $94 a barrel. That drop was part of a wider commodities sell-off last week, spurred in part by steep margin increases of 84 percent in silver over the past two weeks. U.S. crude prices, which rebounded from last week's rout to settle up $5.37 at $102.55 a barrel on Monday, traded down following news of the margin increase, off $1 a barrel at one point in late New York activity. CME [CME.O 295.01 3.42 (+1.17%)], parent of the Chicago Board of Trade, said on its website that it had hiked margins for crude oil futures on the New York Mercantile Exchange by $1,250 per contract. With open interest in the contract topping 1.65 million lots last week, that would amount to an over $2 billion increase in total. Margins are deposits paid by investors in futures markets, where full payment is made when contracts mature, to an exchange or clearing house to cover the risk of default by that investor and typically are based on the largest most-likely daily market move. However, margins can also be used as a tool to curb speculative trading activity, particularly "hot money," by reducing the number of positions a party can hold by leveraging a particular amount of money. CME also increased Brent financial futures margins by 23.8 percent while RBOB gasoline margins were hiked by 21.7 percent.